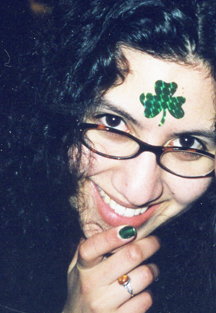 Since Sophie posted such a lovely non-standard head shot of herself last week, the least I can do is post this St. Patrick's Day photo since it's St. Patty's day today. Did everyone remember to wear green? I'm at an age where lots of my friends are having babies. And along with the babies, the vast majority have started baby blogs. I love being able to keep up with my good friends who are spread out across the country -- seeing how their babies are growing and walking and saying the funniest things. But I'm also curious about what the babies themselves will think a few years from now. They say that kids growing up today are much more open to having everything in their lives public, thinking nothing of posting their most personal or outrageous details on Facebook or YouTube. But I wonder how far that extends. Will they really want their friends watching videos of diaper-clad tantrums? They're super-cute tantrums, it's true. But still. The first week I was on Twitter, I obsessively wondered how much was oversharing. I got over it once I got the hang of it, and now I'm having a blast (and I think I found a happy medium). But what about posting on behalf of your kids? I know I'm probably overthinking the whole thing -- but remember, anything posted online is potentially out there forever. i used to be pretty careful about my kids' privacy, and then i saw how much their contemporaries were putting out there. over the weekend someone told me about a service that puts ALL your info out on the web for anyone to see. scary. but - all that said - i love seeing my friends' family albums on the web. i adore watching the kids grow up, virtually. I do worry about child predators, however they are among other things lazy, cheap, and beyond craig's list don't seem very tech savvy, so that's somewhat reassuring. I am also reminded of my best ex-boyfriend Mark. He said he couldn't get into trouble growing up in Sunnyvale (in the 1960-70s), because everyone in town knew his mom, and they would always say "I saw Mark at the blah blah," so he knew he was busted before he even started.